Al B shares his secret recipe for the dazzling effects of acrylic pour painting. 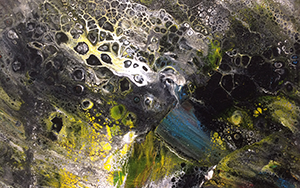 Students will learn to set chemistry into motion on a textured canvas, guide color mixtures into desired compositions, and manipulate the surfaces of their work by scraping through to expose layers beneath. Prepare to see the interplay of delicate bubbles, bold color contrast, and interesting texture in these expressive abstract paintings. Also, dress for a messy creative experience! This class is recommended for students 14 and up.